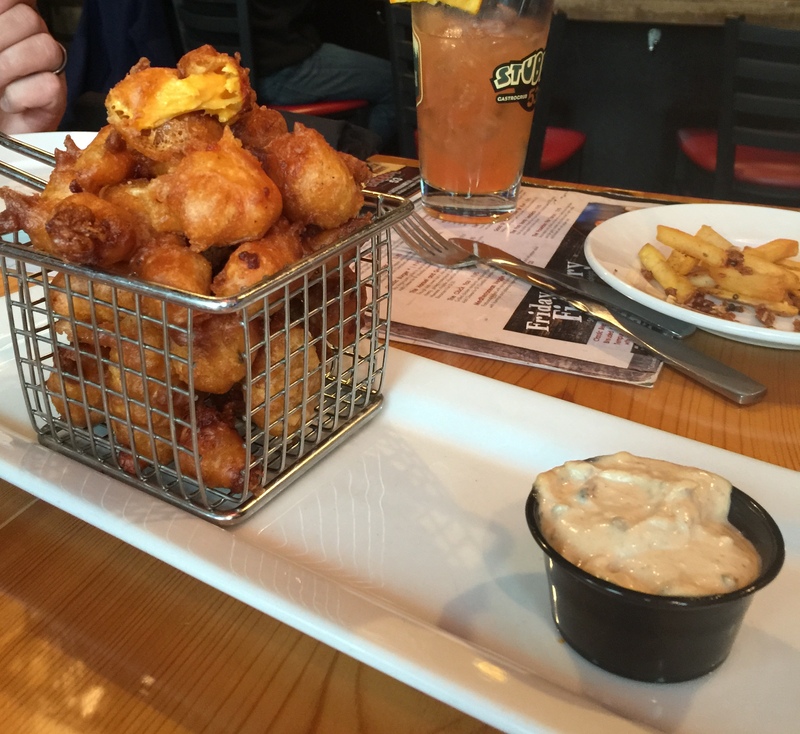 Fried Cheese Curd Challenge – The Winner is…. 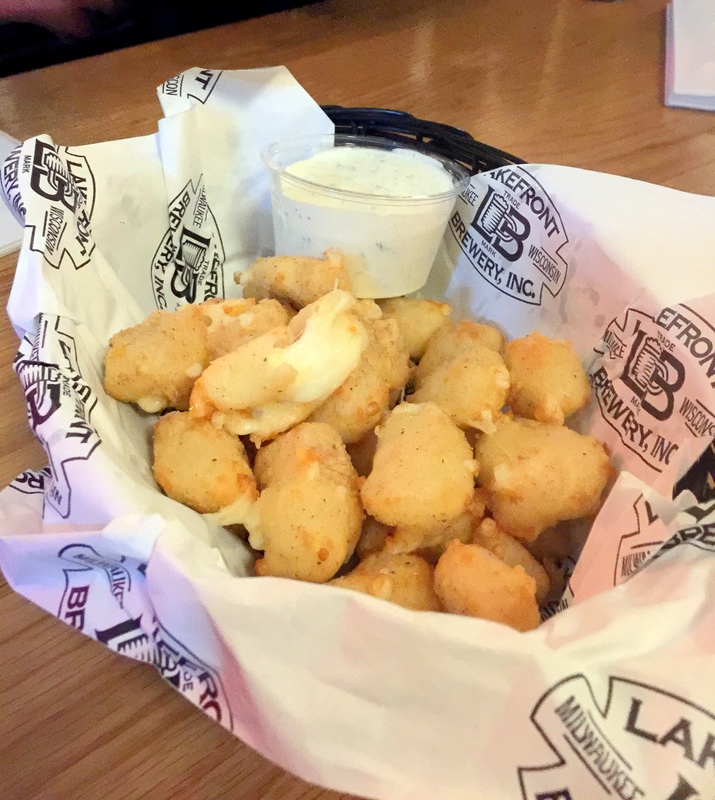 Last week we asked our members to tell us where to go to get the best fried cheese curds in the area. Everyone had so many suggestions, we decided to just pick three of the suggested places where the menu description was clear; these were hand-battered and fresh fried. These curds, with a thin Beer Hall Wheat Ale breading coating the white Clockshadow Creamery cheese, have the potential to be amazing. We think the problem with our batch was they were not fried long enough or the frying oil was not hot enough. (Cooks, I am sure you can tell us the reason) These curds were kind of pale, greasy, and not very crispy. The saving grace on this one is their house-made garlic ranch — DELICIOUS, and the best dipping sauce of the night. You could put this sauce on a shoe and I would eat it. 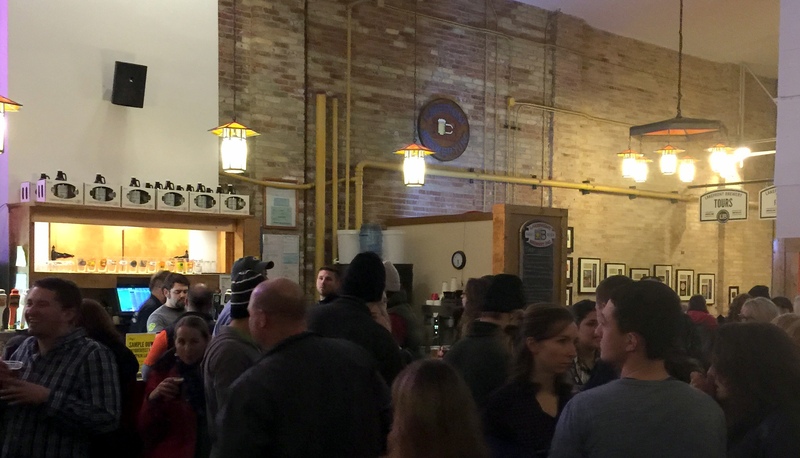 By the way, it was clear to see that this was the busiest beer tour in Milwaukee — the place was packed! The beer hall was huge: beer is ordered at a long bar and food is ordered at an ordering station in the front of the hall. Absolutely reminded me of the beer halls in Germany and Austria. 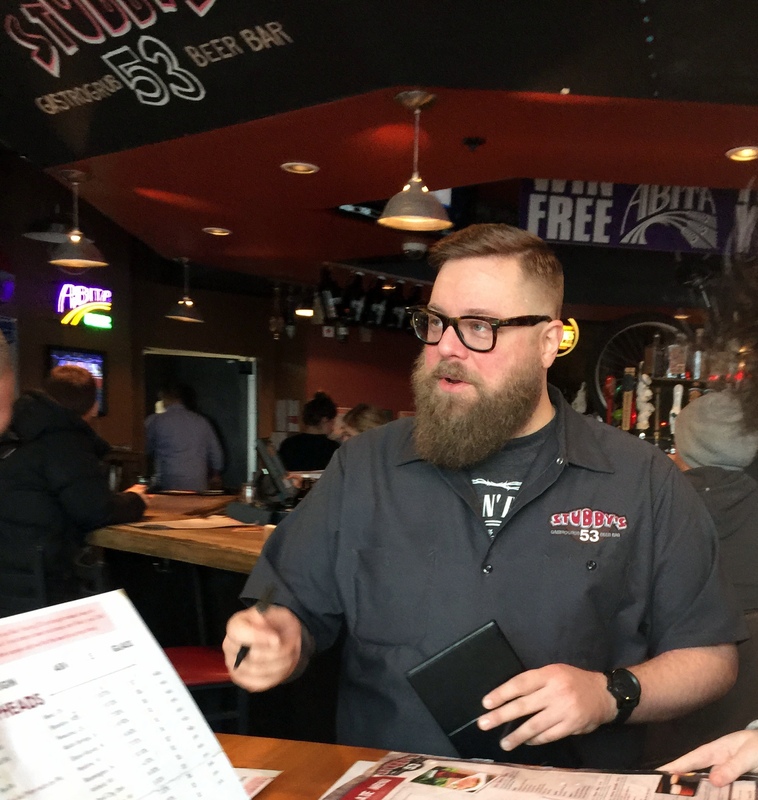 If you have out-of-towners that want to do something beer-related in Milwaukee, this is the thing to do. A nice, light batter coated these white cheese curds. Crispy, golden brown, and tasty. 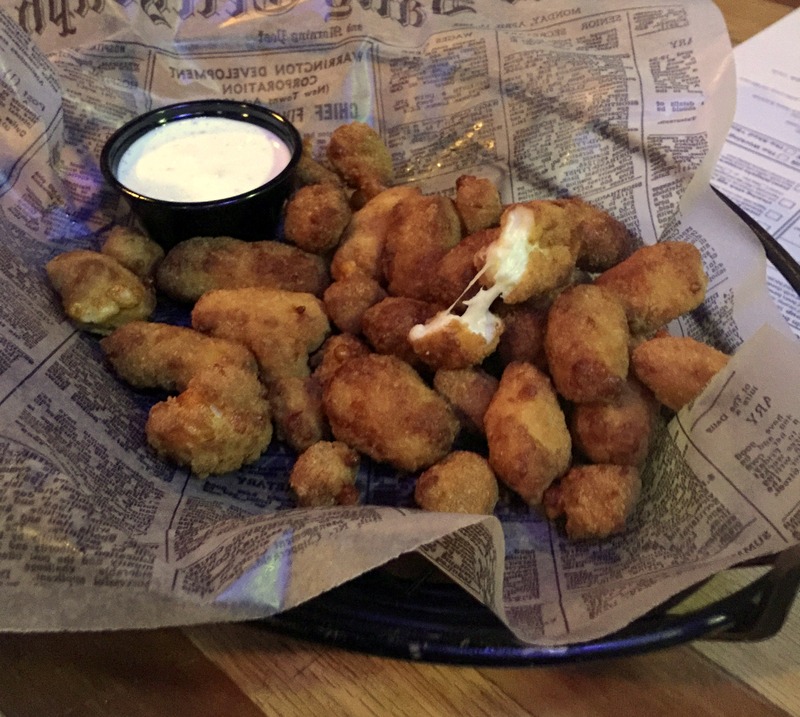 The kicker – the curds are mixed cheese types; some are jalapeno, some are just white cheddar. If you like spicy, you will like these curds. If you are not a lover of spicy food, this may be a deal-breaker because its virtually impossible to differentiate between the jalapeno curds and the plain ones; it’s a surprise every time you pop one in your mouth. The white cheddar ones had really great flavor, whereas the jalapeno curds had almost overpowering heat. We chose the ranch for the dipping sauce, but marinara was also an option. Whoa! When I think about excellent cheese curds, I remember how much I loved the ones that were served at Salmon-a-Rama in Racine. Stubby’s curds brought me right back to that happy food memory. These yellow cheddar curds were very lightly battered and fried to crispy perfection. The curds were served with a bacon-Parmesan dipping sauce, and although I appreciate Stubby’s efforts, it just wasn’t the perfect complement to the curds. A ranch-style sauce would have been better. This was not a split decision, our entire party judged Stubby’s as the hands-down winner for curd flavor and crispness; Stubby’s is the big winner. The beer selection was phenomenal and the waiter was great. I was not raised in Wisconsin so cheese was not very often part of any meal I grew up with. I find it strange to deep fry little peices of fat and dip them in more fat. Just sayin!